Home > Popular Category > Bird Supplies > Bird Treat > Grains and Greens Variety Blend Bird Treat Type: Canary / Finch, Size: 8 oz. 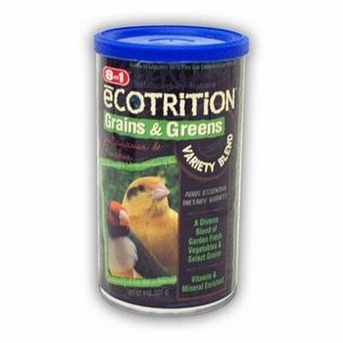 Grains and Greens Variety Blend Bird Treat Type: Canary / Finch, Size: 8 oz. New SURP package. Diverse mix of nutrient-rjich garden vegetables and select grains. Our Variety Blends incorporate a delicious mix for fruit, vegetables, seeds and grains to add diversity to your birds diet. Provides essential dietary variety to keep canaries and finches stimulated and interested in their daily meal. Diverse mix of vegetables and select grains. Vitamin and mineral enriched.